I'm in my 3rd season with the Ottawa Ice and I love every minute of it! I started playing in January 2007. A teammate on my hockey team played for Nepean Open A at the time and they were looking for a goalie, so I said I would try it out. I was too young to play but the Nepean Belle AA team said they were looking for a 2nd goalie. I went out to a practice, not knowing any of the rules, and loved it! The following year I played with the Belle AA's again. We won provincials and went to nationals in St. Albert, Alberta and came home with the gold! I played in the gold medal game, as well as most of the other games during the tournament. The following year I was drafted by the Ottawa Ice and have been playing with them (as well as Senior AA women's hockey) since. For the past 2 summers I have been the head goalie instructor at the Carleton University Ringette camp, and the Gloucester-Cumberland Ringette Association Competitive camp. I'm also the goalie coach for several teams in the Ottawa area, ranging from Novice B to Belle AA. I love coaching as much as I love to play the game! 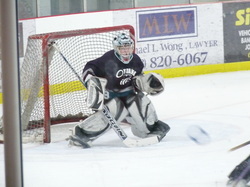 Favourite part of being a Ringette Goalie – I've always been a goalie. I like my teammates being able to rely on me to make the big saves. The more pressure I feel, the better I play. And I love shoot-outs! Best gift received – My first painted helmet, which my parents had done for me in 1999. It had a panther coming out of a brick wall, since my nickname in hockey was "The Wall". It was painted by Marlene Ross in Brockville, ON (who has painted a total of 4 helmets for me). Life Lesson - Believe in yourself and you can do amazing things! Favorite Movie – Miracle, The Incredibles, Chicago, John Tucker Must Die, and I love Horror and Comedy movies! Question: If you weren’t a Ringette Goalie, what would you be? - I'd still be a hockey goalie (play AA hockey as well). Favorite band or artist - Paramore, Rise Against, the Spill Canvas, Pink, Kesha, Eminem, Metallica, Nickelback... I love all kinds of music! Unique characteristic –  I sing during games, just something that keeps me focused.